WASHINGTON, Aug. 18, 2014 - President Barack Obama has announced that Iraqi forces, aided by on-going U.S airstrikes, have recaptured Mosul Dam from ISIL terrorists. U.S. military officials said American aircraft had conducted a total of 68 targeted airstrikes since Aug. 8, the majority directed at setting the conditions for Iraqi security forces to retake the dam. "These strikes were conducted under authority to support Iraqi security forces and Kurdish defense forces as they work together to combat ISIL, as well as to protect critical infrastructure, U.S. personnel and facilities, and support humanitarian efforts," a release from U.S. Central Command said. The attacks are aimed at preventing ISIL forces from receiving reinforcements, Pentagon Spokesman Army Col. Steve Warren said, as well as reducing their defenses. This "will allow [Iraqi security forces] to conduct maneuvers around the dam," he explained. No U.S. military personnel were involved in the ground operations, the colonel said. "We do have U.S military overhead in these aircraft that are conducting airstrikes and of course in our [joint operation centers]," Warren said. The Mosul Dam captures the flow of the Tigris River, providing flood control, water and electricity to Mosul's 1.7 million residents. First opened in 1986, it is the fourth-largest in the Middle East. "If the Mosul Dam were to fail, that would lead to a humanitarian disaster," Warren said. And failure is a real concern, he added. The dam's location was "chosen for reasons other than geologic or engineering merit," according to a 2007 report by the Army Corps of Engineers. While the report found that the dam itself was well-constructed, the underlying geology is a cause for "intense concern about the safety of the structure." The dam's bedrock foundation consists of water-soluble rocks, such as gypsum, marl and limestone, and the presence of the dam's reservoir is hastening subsurface dissolution. The geologic conditions under the dam necessitate "extraordinary engineering measures to maintain the structural integrity and operating capability of the dam," the report said. 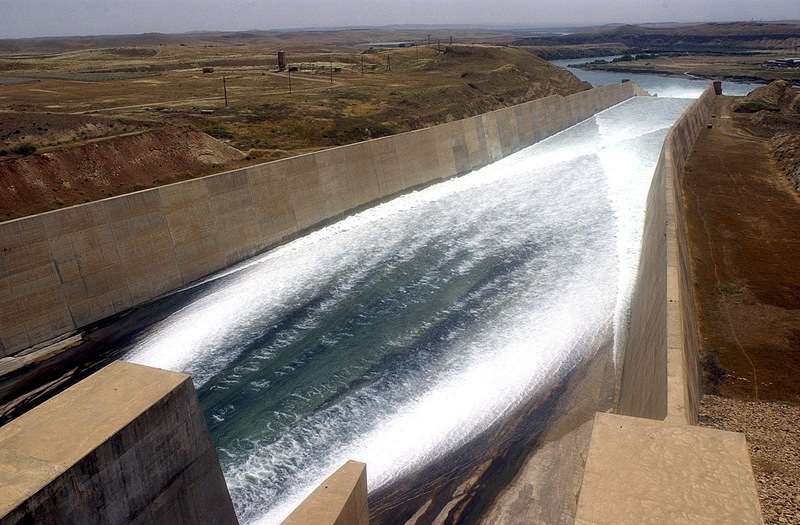 A constant program of maintenance is needed to ensure the dam is not undermined, which could unleash a floodwall that would travel southward down the Tigris River valley all the way to Baghdad, nearly 300 miles away. A letter sent by President Barack Obama to Congress yesterday said the dam's failure would endanger the lives of large numbers of civilians, U.S. personnel and facilities, including the U.S. Embassy in Baghdad, and prevent the Iraqi government from providing critical services to the Iraqi populace. Note: The above U.S. Army photo of the Mosul Dam was taken by Staff Sgt. Brendan Stephens.